I greet you in the mighty Name of Jesus Christ – Creator, Sustainer, Saviour, and Lord. I hope that you are doing well and are in good health. It is with joy that I am able to report that my recent Mission to Malawi has been successfully accomplished. I am amazed at the incredible way that so many of you got involved in supporting this mission. I certainly would not have been able to accomplish this without your help. I will soon publish a mission report and a financial report. I was able to keep my Facebook Page: High Light Africa updated whilst in the field. If you would like to see some of the pictures and videos I posted you could find them there. Please continue to pray for the people in Malawi as they are facing a particularly harsh hunger season this year. We find it difficult to comprehend a ‘hunger season’ – we think we’re hungry if we’ve missed lunch. These folk miss many meals – some go for days without food. The hunger season normally lasts about 2 months, but this year it will be much worse, lasting more than 6 months! Each time you eat a meal, please remember to pray for those who are struggling to find food. I am immensely grateful to all who got involved in various ways to make this mission a success. Thank you very much to those who helped by donating funds, those who prayed, and those who encouraged. May God bless you abundantly and perpetually! 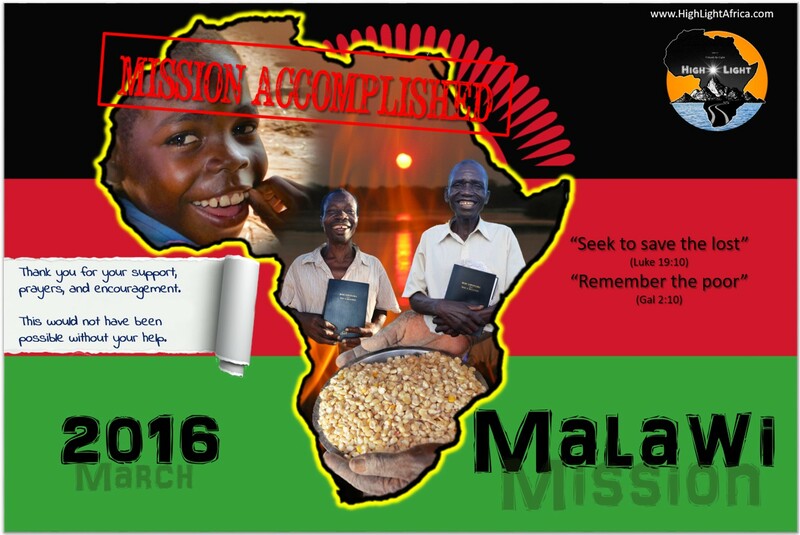 Previous Mission to Malawi – Ready, Steady, Go!